Look for the gifts in everything!!! Live life always being thankful to GOD for every situation, with an attitude of gratitude. 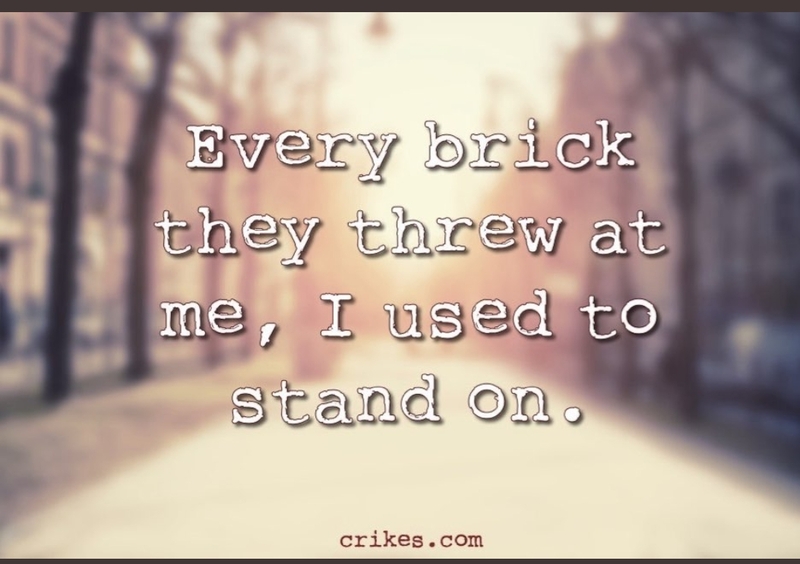 Every brick they threw at me, I used to stand on!!! “….my grace is sufficient for you…” 2Corinthians12:19!!! “My grace is sufficient for you, for my power is made perfect in weakness.” -2 Corinthians 12:9.!!! “When men are cast down, then thou shalt say, There is lifting up; and he shall save the humble person.” Job 22:29. Within an unfavourable environment, God created a favourable atmosphere for Elijah; within the environment where things went wrong, God caused things to be fine for Elijah; in the place where others had no provision, God provided for Elijah. Things were not fine in Israel, but God made Elijah’s case different. Friend, within the same environment that is unfavourable, God will create a favourable atmosphere for you. In the same places where others were rejected, God will cause you to be accepted; in the same places where people are insecure, God will secure you; in the same places where people are hopeless, God will arise on your behalf; in the places where others receive bad news, you shall have good news. Things may go wrong for others, but God will make things right for you. Your destiny does not depend on what is happening around you; your destiny is not defined or determined by what is happening in your nation. Your destiny is a function of God’s word concerning you; your destiny is all about what God is able to do for you. Look beyond men and focus on God. If God is on your side, things will turn out differently. If God is on your side, what affects others will not affect you. Pray With Me: Lord, what affects others will not affect me; my case is different, in Jesus’ name!